Anyway. The new issue of Mojo has a track by the La's on the CD. The theme is 80s indie classics. I wonder if they have selected anything other than There She Goes? The Smiths are the main mag feature, so it's possible they used the Morrissey-endorsed Way Out. It's actually Open Your Heart! Andy Bell selects a favourite album for each five year interval of his life. Noel and Liam got me into this record just when I joined Oasis. We were all in a dressing room somewhere, and there was a compilation tape that Noel had brought along playing. The song "Looking Glass" came on, and I just couldn't believe it. It was one of those things where you discover something too late and you become even more excited by it. For Beady Eye, the La's are a massive influence on what we do. I will never understand why the smiths are held in such reverance. eggyroader wrote: I will never understand why the smiths are held in such reverance. Clean out yer ears. And wash yer mouth out with soap and water. Then pop round to mine so's I can spank you with a wet plimsole. How dare you. How very dare you. lol wondered how long it would be before someone pulled me up on that! INSPIRAL CARPETS, THE LA's - 1990. 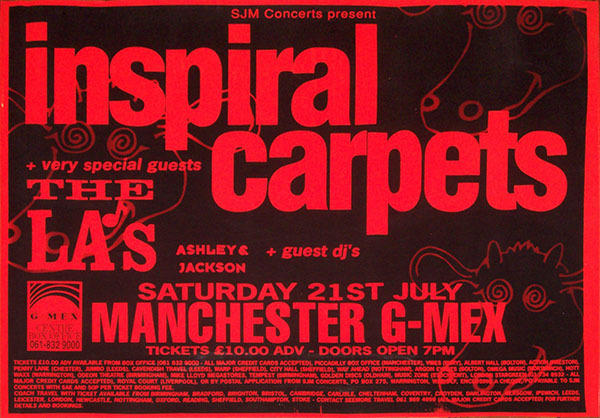 Vibrant original Inspiral Carpets concert poster from the pinnacle of the 'Madchester' era, supported by The La's, the great unfullfilled talent of the period. Noel Gallagher once asserted that Oasis's mission was to finish what the La’s had started. From Liverpool, the home of British rock royalty from the Beatles to Echo and the Bunnymen, the La’s were led by the gifted, and troubled, Lee Mavers. The band cut just one self-titled album helmed by the classic single ’There She Goes’. A slew of producers worked on the record, which was finally completed, under much duress, by Steve Lillywhite. Mavers, who sporadically reunites various versions of the La's, claimed he was never happy with the release and to this day is still working on the elusive foIIow-up. And so the great Merseyside pop tradition continues. From the hallowed stomping grounds that formed the sounds of the Beatles, now come the La’s; four lads From Liverpool with melody to burn. Formed on the Merseyside four years ago, the La’s released three singles on the Go! Discs Records label, which have since become serious collector’s items on the UK underground scene.The second of these singles, ‘There She Goes’, is now making waves on the Australian indie Front, as is the band’s debut self-titled album. Time Off asked singer, guitarist, songwriter and founding member (man, that's some title), Lee Mavers, about the formation of the band back in ’86. As Lee explains, the current line-up had solidified by '88 and the La’s began constantly gigging around Liverpool and London. ln one single fortnight, the band perform ed a staggering seventeen shows. Early last year, the twelve-song debut LP hit the streets and the band became more selective about their live appearances, preferring to play larger venues. According to Lee, however, he and the other members are not at all pleased with the album. Well, yes I do, actually. As well as his great desire for me to understand what he means, Lee is very concerned about finding a suitable producer for his band's soon-to-be-recorded second album. Is that America you say? Well, until then, check out the melodies, the harmonies and the clean-cut guitars of the La’s. July 1991. Original text: Brent Hampstead. Interesting. Doesn't sound too dismissive of the album there and was looking to album #2. Pridden material - Possibly in Universal's vaults, if it even got underway? But that might have been just Lee and the band testing him out, nothing official with a label. The band still had a little while to go before they imploded. I wonder what the business relationship with Go! was like at this point. Lee is talking here like it's on him to find the next producer - but that might be a sensible gamble anyway after all the fuss of album number one. Mentioning the next promotional tour, though, suggest the intention was to get on with things. Given that, I wonder when the mindset of "redo the first songs, before the new ones" solidified? Doesn't seem to be quite present here, although there's a hint of it.